BlowOUT and BlowUP your upper body at the end of your next training session with this push-up variation that improves work capacity, conditioning, and strength. Bowler Squat for First Step Speed? The Bowler Squat is an exercise you generally see in a physical therapy setting and is used as a basic way to teach multi-planar single-leg stability. We’ve used these at SAPT for quite awhile as a regression for athletes who are struggling with single leg balance to the point that they can’t execute a single-leg hop with a balanced landing. But who are more advanced than limiting exercises to side-lying clam level. This is an athlete who has excellent lateral hip strength and can demonstrate a safe, controlled landing. For athletes who aren’t able to display control, we look to regress, often with the Bowler Squat. If you take a look at the pictures above you will see both a knee cave and a large hip drop in the example of the Bowler Squat illustration. 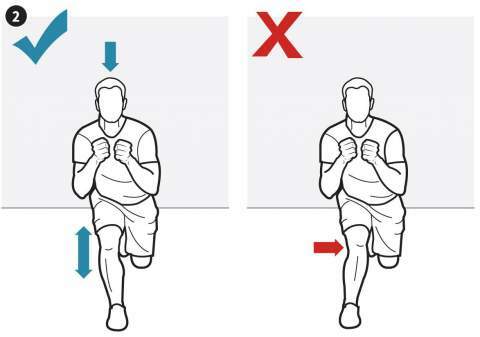 Most importantly, you will see the same hip drop translate over to running stride - this is a giant red flag signifying weak lateral hip musculature on the support leg (the leg opposite of the dropped hip) and a VERY REAL risk of injury (groin, ankle, knee, hip, etc.). The Standard Bowler Squat is a great way to work on multi-planar single-leg stability. Beyond using the Bowler Squat as a way to teach stability and balance, I also like to use the Bowler Squat as a part of my dynamic warm-up with elite athletes as a way to prime/activate their core muscle function. We’ll do several variations of them: straight forward Bowlers with a lateral knee touch, eyes closed, or as part of a single leg balance sequence (again I use a few variations of these). This is an advanced variation of the Standard Bowler Squat. It can be used as a challenging addition the warm-up for high level athletes. The 1-Leg Balance Progression is a great warm-up sequence for runners that challenges balance. Up until recently, that’s about as far as I had ever taken the Bowler Squat both in theory and practice. But, Tim DiFrancesco (formerly the head strength coach for the Los Angeles Lakers) posted about the Bowler Squat being a great exercise for first step speed development. I had never thought of the dutiful Bowler Squat in such grand terms! It gave me an opportunity to reframe the exercise as I watched some of the athletes I work with play their sport of basketball. To be clear, I am taking this post further than what Tim’s initial post suggested, so these are my own conclusions based off of a simple thought he posed. I didn’t have to look long or hard to find the Bowler Squat in action and came up with an almost endless list of ways the Bowler Squat can be woven into performance exercises. Over the past couple weeks I’ve started experimenting by using certain variants of this with athletes who are already and must continue to perform plyometric movements, but who struggle with stability, control, and tension. With only a couple weeks to consider and experiment with a mental reframing of the Bowler Squat as possible driver for first step speed, I would hesitate to assign it too great of importance. I really like the balance challenge and how it naturally forces an athlete to focus and tighten up with a few reps prior to a jump, but the real workhorses behind first step speed continue to be the Bulgarian Split Squat and all it’s variants as my number one choice - with all other lunge, squat, and deadlift variations following closely behind. Ensuring an athlete has the ABILITY to execute a perfect Bowler should be a prerequisite to any single-leg plyometric activity. But, being as strong as possible is always the foundation for durable, resilient, and effective performance. If you are a coach and have any experience utilizing these types of combos, I’d love to hear what you use and how you feel about the results. Ever wonder what the number one quality of the most successful and elite athletes is? Learn about consistency and some tips for you or your family.